HOW IT WORKS: Turmeric is a plant in the ginger family that has been used to provide health benefits for thousands of years. Its main active substance, curcumin, has been found to have benefits in many areas including joints, the respiratory system, the immune system, and the gastrointestinal tract. In addition to its ability to support cellular health via its potent antioxidant properties, it is probably most valued for supporting a normal response to inflammation. 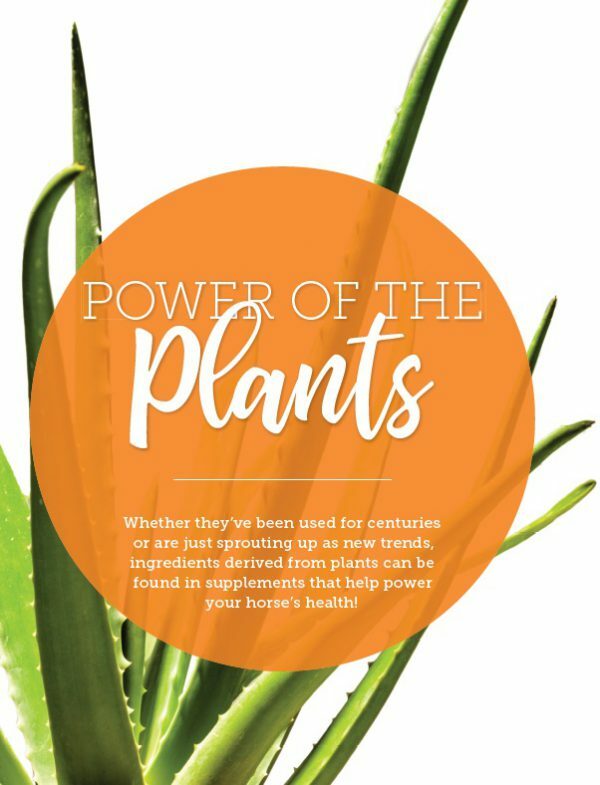 HOW IT WORKS: Aloe Vera has one of the longest recorded histories of therapeutic use in humans and animals, dating back to the 16th century BC. The gel inside the leaves contains a host of bioactive substances, including vitamins, minerals, amino acids, and enzymes, as well as lignans, glycoproteins such as lectin, flavonoids, polysaccharides, carotenes, and many others. Numerous studies have demonstrated its positive effect on stomach and hindgut tissues, most likely due to its antioxidant and cell-protective properties. HOW IT WORKS: Devil’s Claw is a South African herb named for its fruit, which can look a bit menacing, but is quite beneficial. It’s known for supporting a normal response to inflammation and helping address discomfort in joints, bones, and other tissues, making it ideal for senior horses or other horses experiencing the stiffness associated with exercise and aging. HOW IT WORKS: Resveratrol is a potent antioxidant found in red grapes that has been demonstrated to support joint integrity in recent years. This unique ingredient is known not only for its ability to protect cartilage from the damaging effects of free radicals and to help address joint inflammation associated with heavy work, but also for its effects on the cardiovascular system, blood sugar levels, brain cells, and musculoskeletal health. HOW IT WORKS: Spirulina is a blue green alga celebrated for its nutritional value and its many documented health benefits. This “super algae” contains vitamins, minerals, the fatty acids EPA and DHA, and numerous other phytonutrients, including flavanols, carotenoids, and C-phycocyanin. Along with supporting immune function and a normal response to inflammation, it has been reported to help horses prone to respiratory issues, especially those associated with seasonal allergies. HOW IT WORKS: Chasteberry (which is also known as Vitex agnus castus and Monk’s Berry) is a plant native to the Mediterranean region. It has been used for centuries to help maintain a balanced hormonal system in both females and males. Along with being beneficial for cranky, irritable mares and studdish geldings, this ingredient is also helpful for supporting proper endocrine function and normal shedding in older horses. HOW IT WORKS: Adaptogens are substances that support systems compromised by stress and help protect against a wide variety of stressful influences. That’s why they’re most widely found in products designed to support proper metabolism and immune function. A few examples of adaptogens to look for include astragalus, Siberian ginseng, and Rhodiola rosea, which are all herbs that have been used in traditional Chinese medicine for thousands of years. HOW IT WORKS: Valerian is a “nervine,” or an herb with specific actions on the nervous system. It may help balance the nervous system in horses struggling with restlessness or anxiety. Because it can also help address muscle cramps and spasms associated with tension, it’s especially helpful for horses who hold their anxiety in their muscles.